It is one of the most popular destinations in Japan, visited by more than 7m worshippers and tourists each year and revered as the spiritual home of the Japanese people. But Ise Jingu, or the Grand Shrine of Ise, is also a mystifying site that, to many Japanese, is likely to seem at once familiar and strange. It was this paradox that I found most striking when I visited Ise Jingu recently on a pilgrimage that most Japanese are encouraged to make at least once in their lifetime. As the most sacred shrine of shintoism, Japan’s indigenous faith, Ise Jingu has all the features common to numerous other shinto shrines scattered throughout Japan, from the towering torii gates that mark the entrance to the shrine’s grounds to the water font where visitors cleanse themselves before entering the shrine proper. The torii at the entrance to Naiku, Inner Shrine. The purification font where visitors wash their hand before entering the shrine proper. But as I walked through the expansive grounds of the shrine, admiring the pale wooden structures and deep forests of centuries-old cypress, laurel and pine, it became increasingly apparent to me that Ise Jingu looks and feels completely different from the numerous shinto shrines that are an integral part of every Japanese neighborhood. The trees in the surrounding forests can be centuries old. Part of the difference, I discovered, lies in the distinctive architectural style, known as shinmei-zukuri, which harks back to the third century and is marked by an extreme simplicity of form and design. 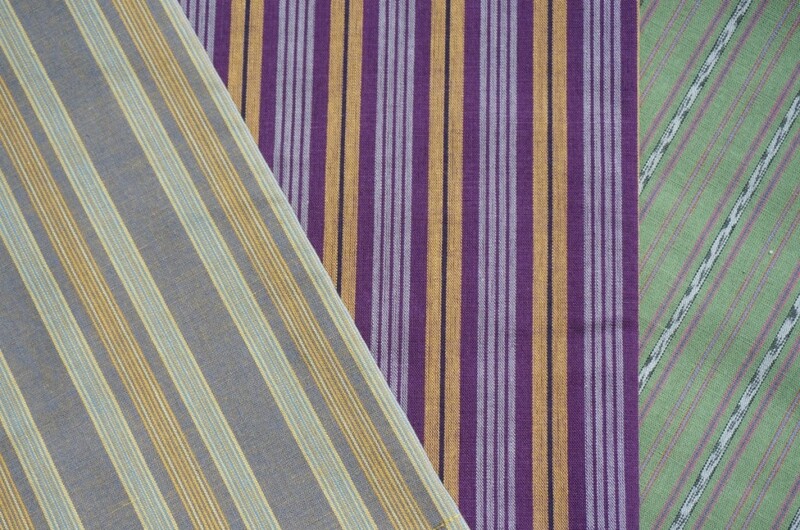 Distinctive crossed beams of the shinmei-zukuri style. Virtually every wooden structure here is made of unfinished hinoki, or Japanese cypress. Ujibashi Bridge is made entirely of Japanese hinoki wood. 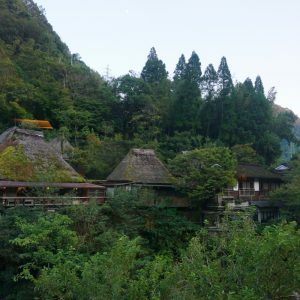 The sanctuaries in the shrine grounds have raised floors and thatched roofs and are topped by decorative logs along the ridge with crossed beams at each end – a style that is endemic to Japan but rarely seen elsewhere in the country. Extremely thick thatch is needed for the shrines to last for 20 years. What embellishments there are tend to be subtle – a pair of deep green sakaki (cleyera japonica) branches with white paper streamers, sudare shades trimmed in silk, protective gold coverings on the ends of the roof beams. Even the torii gates are unpainted, in contrast to most shinto shrines, with their eye-catching bright vermillion gates. The overall effect is of an austere beauty – a beauty that manages to be, at once, both plain and majestic. Sakaki branches adorn the fence of a sanctuary in Naiku Inner Shrine. 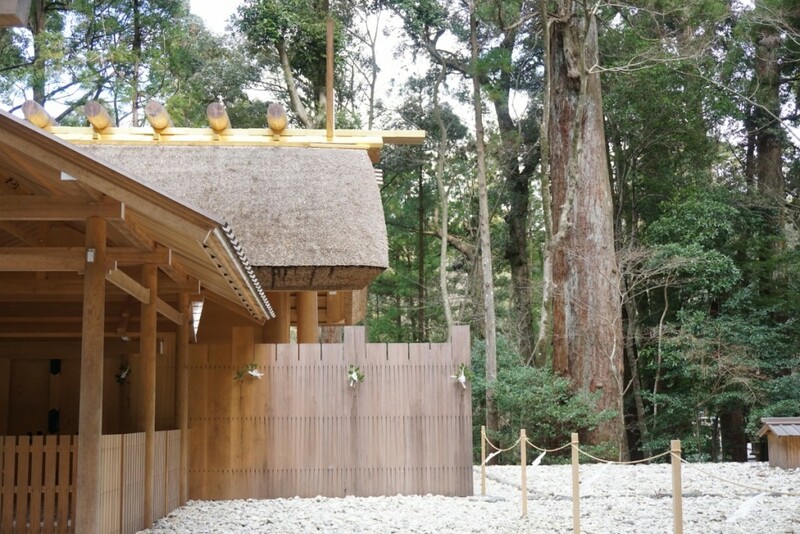 Ise Jingu is also, intriguingly, both ancient and new. That is, while the style is ancient, the actual structures are rebuilt every 20 years in a centuries-old rite known as Shikinen Sengu. 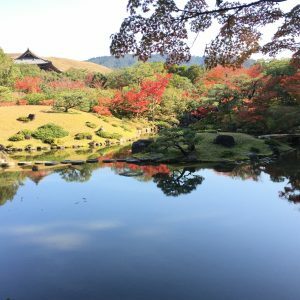 Everything from the massive torii gates to the 101.8-meter long Ujibashi Bridge that carries visitors across the Isuzu River into the grounds of the Naiku Inner Shrine and the 714 different kinds of sacred objects stored in the sanctuaries, are remade. 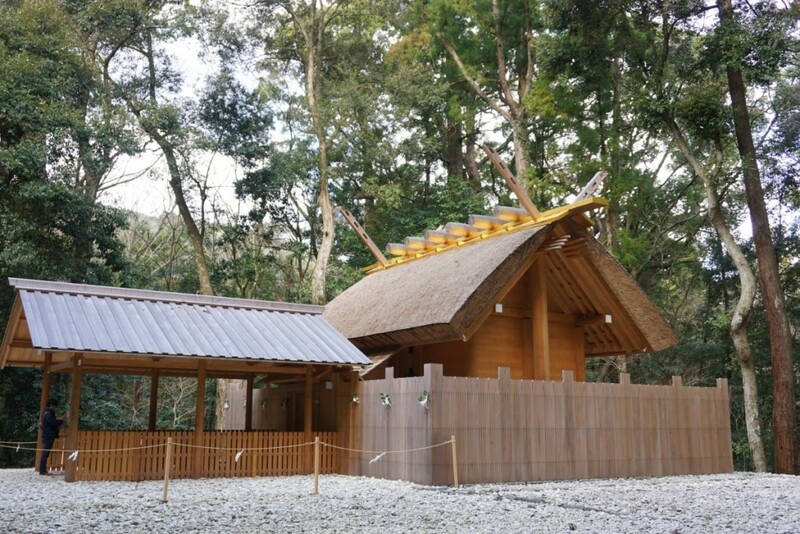 As such, despite its air of antiquity, the current Ise Shrine, which was last rebuilt in 2013, is all but two years old. Much was made of this last rebuilding – the 62nd Shikinen Sengu – when the shrine saw a record 10m visitors. Yet Ise Jingu, with its rituals shrouded in secrecy, remains an enigma to most Japanese. Although as many as 1,500 rituals are held on the shrine grounds every year, so much is hidden from public view that very few people know what goes on behind the sanctuaries’ haloed walls. Worshippers waiting to be admitted into an area that is closed to the general public. The inner sanctum of Naiku, the Inner Shrine, which is home to Amaterasu-Omikami, the sun goddess and ancestor of every Japanese emperor, is so sacred that mere mortals are only allowed to glimpse a fraction of the roof. 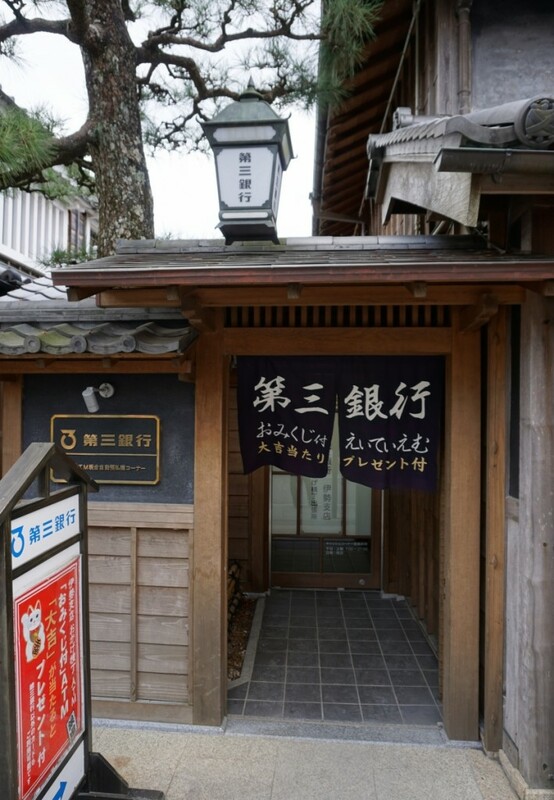 Nonetheless, Ise Jingu is affectionately referred to as “O-Ise-san,” as if it were a friendly, neighborhood housewife. The map on Ise Jingu’s official website is a manga-like illustration better suited to an amusement park than a venerable shrine. After a pleasant walk through the grounds, and a complimentary cup of hot tea in the resting area, I left Ise Jingu somewhat perturbed by these inconsistencies and not much the wiser on the ways of shinto. At the same time, I did feel a clear connection between ancient shinto and Japan today in the simple aesthetic, the veneration of nature and devotion to purity and renewal that have been steadfastly preserved at Ise – values which have just about managed to survive amid the concrete chaos that is contemporary Japan. It was a comforting thought that, for me, made the visit to Ise Jingu a spiritual journey home. 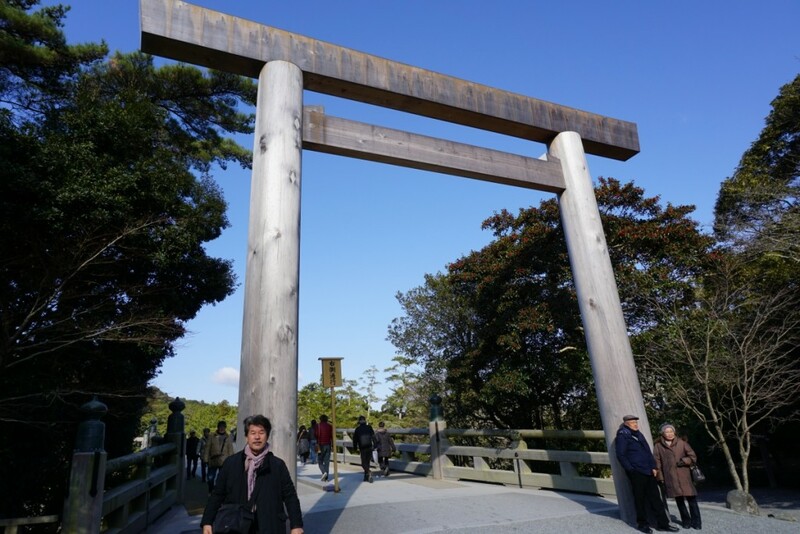 The official name of Ise Jingu is “Jingu,” which in Japanese simply means shrine. Surprisingly, the name does not actually refer to a shrine, but to a constellation of 125 shrines scattered over an area that is roughly the size of Paris. 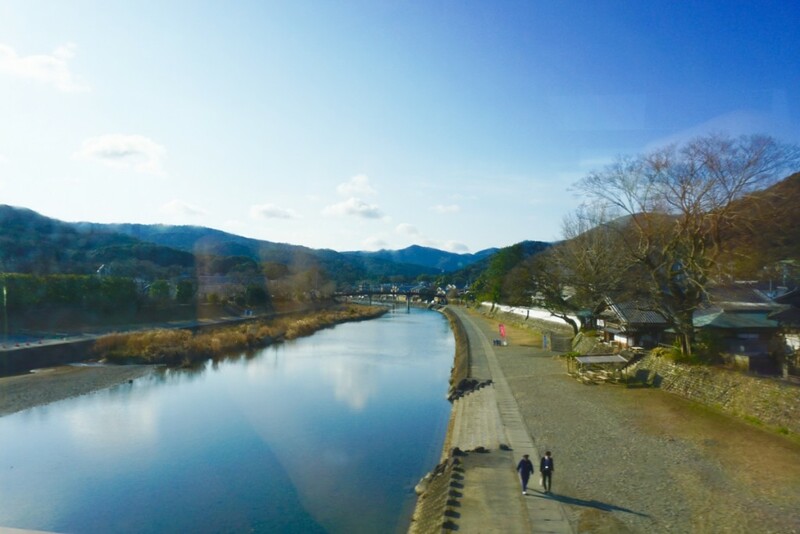 Legend has it that Ise Jingu was founded by Yamatohime-no-mikoto, who was instructed by her father, the Emperor Suinin, to find a permanent location to worship Amaterasu-Omikami, the sun goddess who is the supreme deity of shinto and the ancestor of Japanese emperors. Curiously, Amaterasu-Omikami, who is enshrined in Naiku, or Inner Shrine, and her friend and chef, Toyo’uke-Omikami, who is enshrined in Geku, or Outer Shrine, are both female. 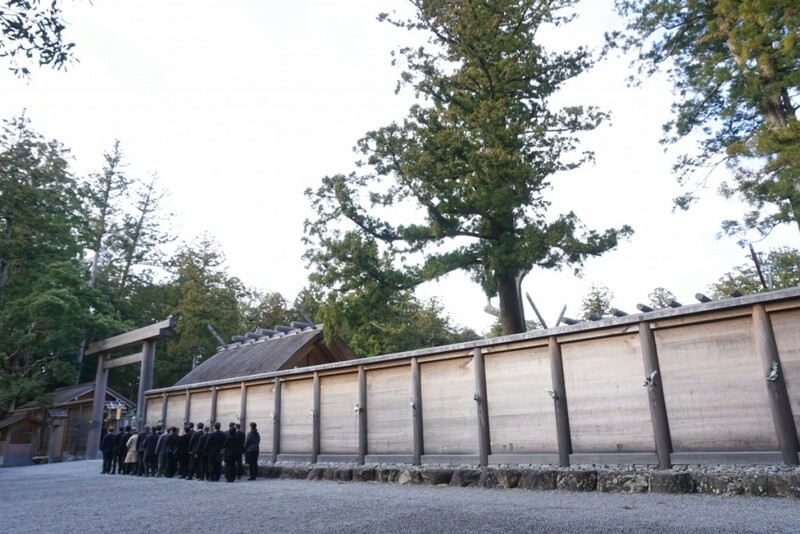 Every 20 years, all the wooden structures of Ise Jingu are re-built in a ceremony known as Shikinen Sengu. 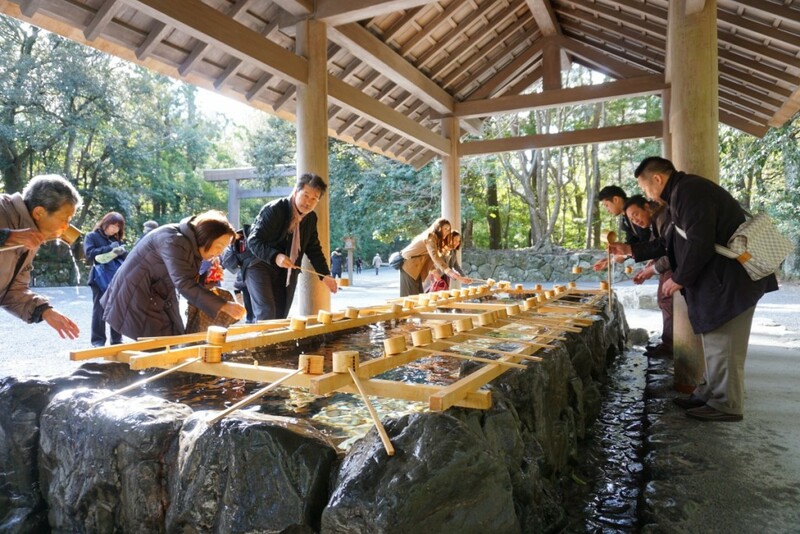 According to the Association of Shinto Shrines, the idea is that sustainability and renewal and the maintenance of know-how and skills are more important than the actual physical existence of a structure or building. Most of the timber from the dismantled structures of Ise is re-used at other shrines throughout Japan. 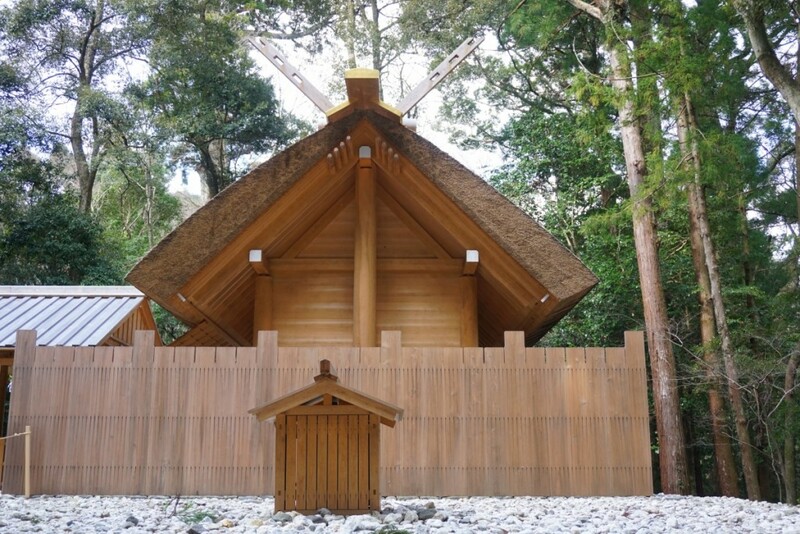 Although it is not possible to see the most sacred sanctuary, where Amaterasu-Omikami is enshrined, there is a life-sized replica of a fourth of the building in the Sengukan. An English pamphlet and audio guide are also available, but all the signs are in Japanese only. From Tokyo, take the Tokaido Shinkansen to Nagoya (1hour and 40 minutes) and change to either the JR Line or Kintetsu Line to Ise-shi. 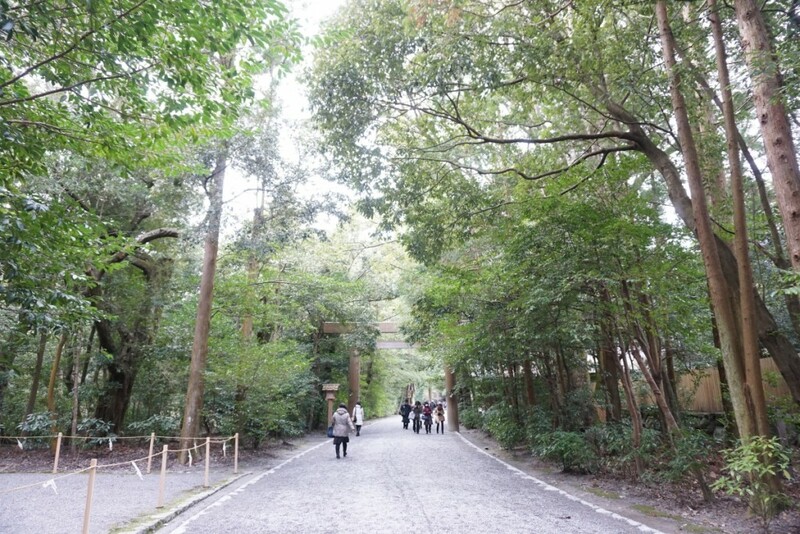 Most visitors start their tour of Ise Jingu at Geku, the Outer Shrine, which is a short walk from either the JR or Kintetsu Line Ise-shi stations. It takes about an hour to walk through the grounds of Geku at a moderate pace. But, to me, the highlight was Naiku, or Inner Shrine, which is a 15-minute bus ride from Ise-shi station costing Y430. 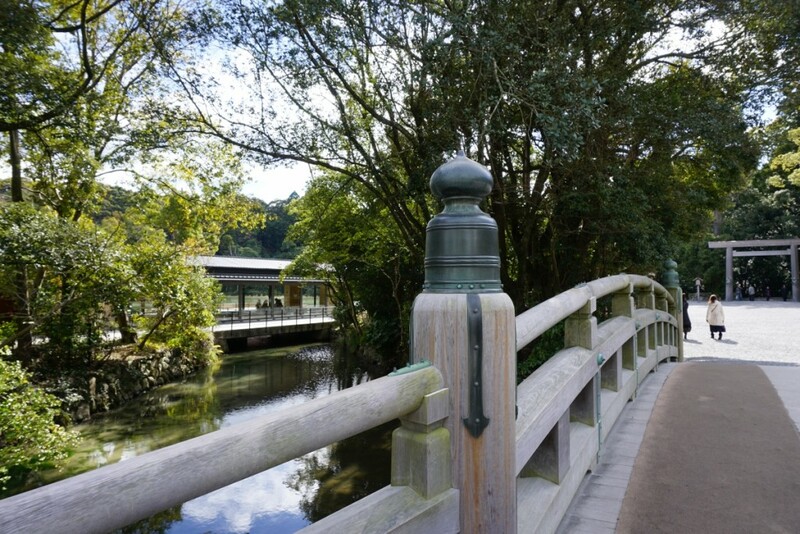 The approach to Naiku over the majestic Ujibashi Bridge, which is made of plain hinoki wood, is quite spectacular and once inside the grounds, the clear streams and ponds of milky turquoise have a soothing effect. Be sure to allow time to stroll around Oharaimachi and Okage Yokocho. 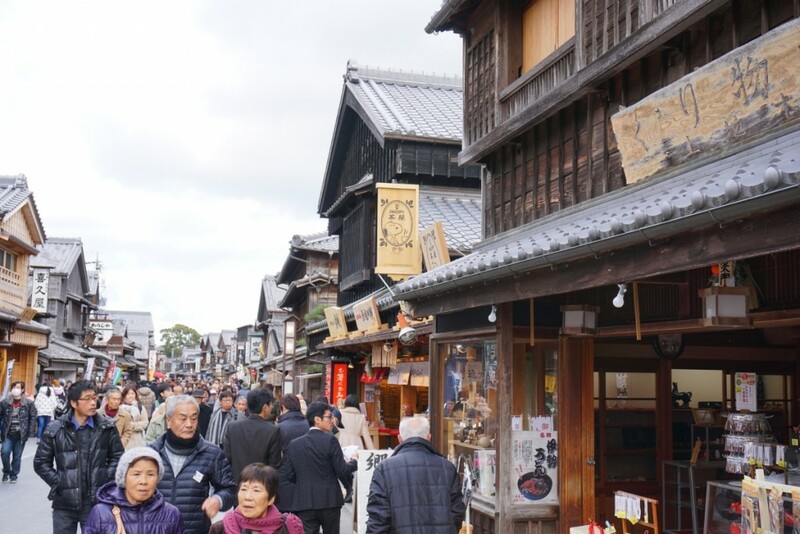 The former is the road that pilgrims in ancient times used to take to approach the Inner Shrine and is lined with traditional Japanese shops selling everything from pickles to incense. Oharaimachi is lined with inviting shops and restaurants. 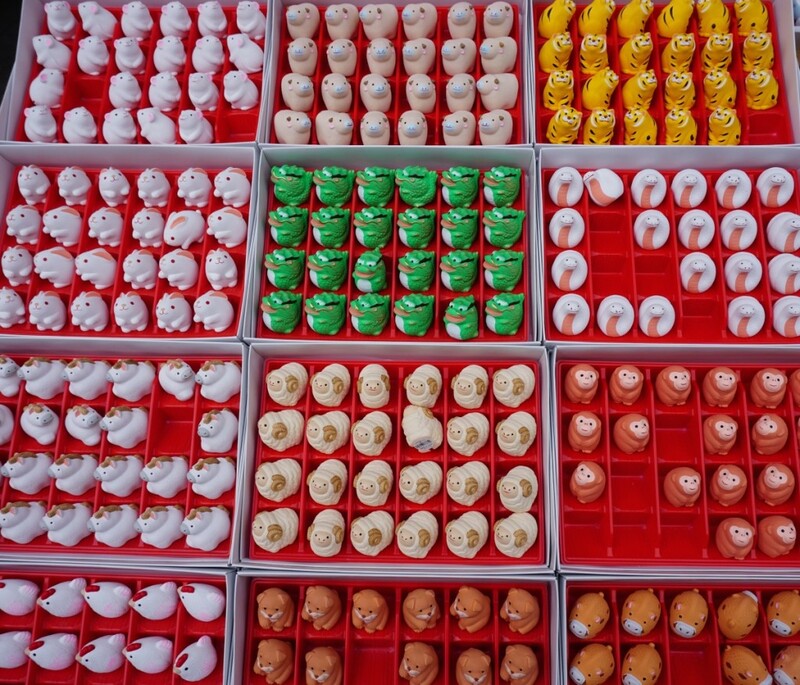 Colorful sweets sold at a shop in Oharaimachi. Ise cotton is soft and absorbent. Daisan Bank in Oharaimachi has a fortune-telling ATM. 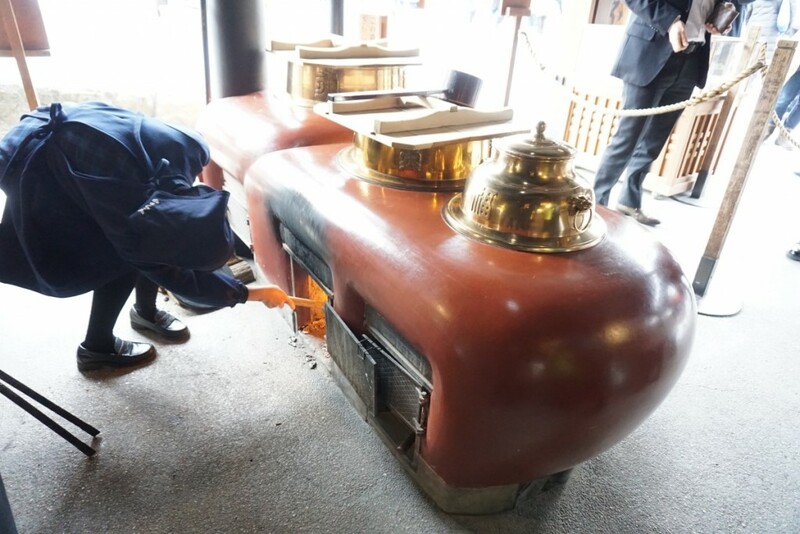 Brewing hoji tea the old-fashioned way at Akafuku, which specialises in sweet rice cakes. Okage Yokocho is an area just off Oharaimachi, where a traditional townscape has been recreated. A leisurely stroll down the nearly 1-km long Oharaimachi and through Okage Yokocho can take more than two hours. 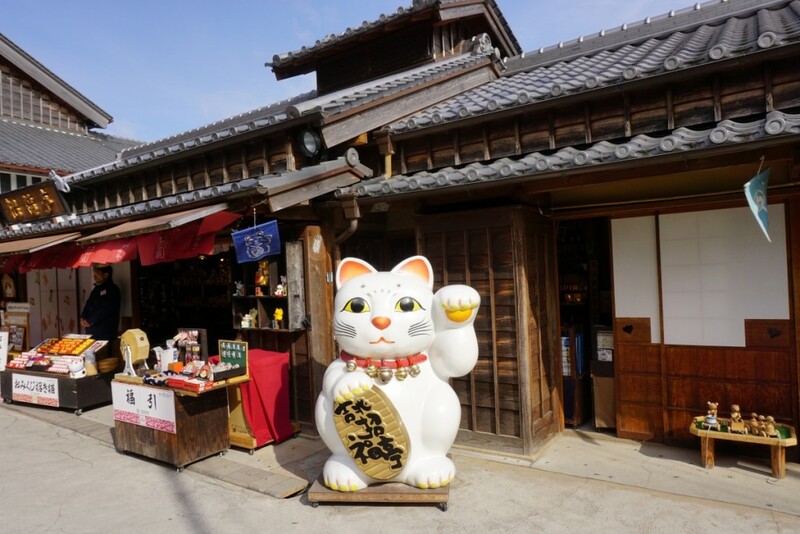 A maneki-neko, or good-luck cat, welcomes visitors to Okage Yokocho. 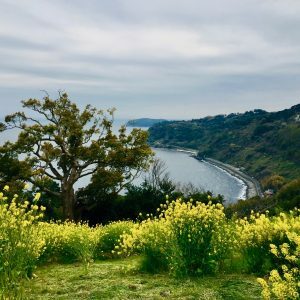 There are many hotels around Ise but a fun place to stay is Shima Kanko Hotel, about a 40-minute express train-ride away from Ise-shi on Kashikojima Island in Ago Bay. The hotel’s main building is currently undergoing a complete refurbishment in order to host the 2016 G7 summit in May, but the new wing, which is open for business, is elegant and comfortable and has spectacular views. 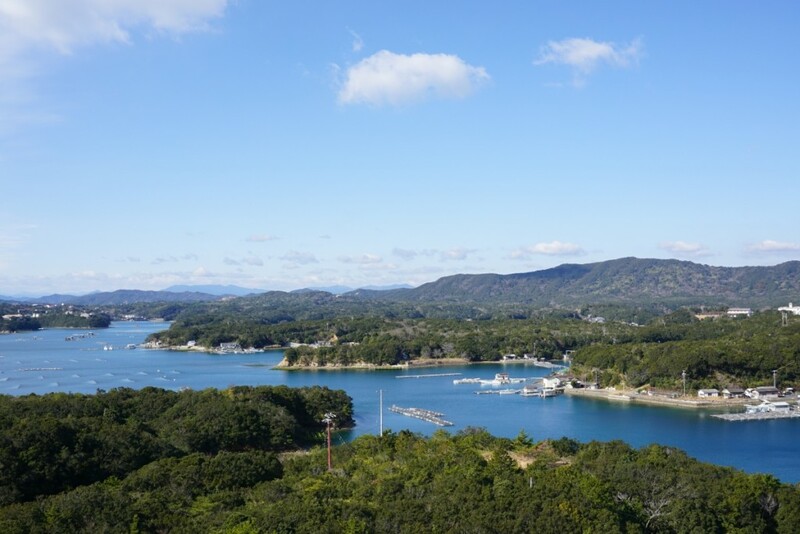 The view of Ago Bay from one of the rooms at Shima Kanko Hotel.